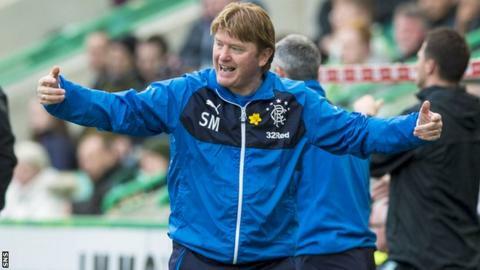 Rangers manager Stuart McCall believes Rangers could compete in the Scottish Premiership next season. McCall is also confident they will be promoted from the Scottish Championship within a year, should they fail to make it through this season's play-offs. "If you look at Hamilton this season, top three until they lost their three best players, Dundee have finished top six," McCall told BBC Sportsound. "If we were in the Premiership we would do well." The Ibrox club trail Hibernian by a point ahead of the final day of the league season on Saturday, with McCall taking Rangers to champions Hearts, and Hibs travelling to fifth-placed Falkirk. Whoever finishes third face a two-legged tie against Queen of the South, with the winner then playing the side who finishes second, over another two legs. The winner of that tie will then play home and away against the side finishing 11th in the Scottish Premiership to determine who is in the top flight next season. "I believe if we were in the Championship next year we would get things right and bounce straight up," said McCall. "If we got promoted, there might be a long way to go before we're challenging Celtic and possibly Aberdeen to maybe an extent." McCall, who has taken charge until at least the end of the season, said their celebrations will be muted should they finish second ahead of Hibernian. "We are aiming to finish second but it won't have any impact on how play-offs finish," he explained. "There are no favourites going into the play-offs, it comes down to who handles the games. "There won't be a great deal of celebration if we finish second, because we won't have achieved anything." McCall also believes the club are right to defy league bosses and allow season ticket holders into their play-off clashes for free. That would breach the rules of the Scottish Professional Football League, which claims 50% of the gate receipts from each play-off match and shares it amongst its remaining clubs. Rangers insist they will hand over half the cash they receive from the sale of one-off tickets, but their decision could cost the SPFL thousands of pounds. "A full Ibrox would be a big advantage in the play-offs. It's totally right for the clubs," added McCall. "When I bought season tickets you would get all the league games and pay for the cup games. The play-offs are classified as league games, so fans should be let in. The supporters have paid, they've shown loyalty in buying season tickets, they deserve to be there [for free]." Read more on Celtic: John Guidetti given warning for making "offensive comment"